Snoring jokes are often routine at family gatherings or friends zone. But most of us ignore the fact that snoring is an indication of underlying health ailments. Studies suggest that 45% of the people around the world do snore and 75% out of them have the problem of disruptive sleep apnea (disturbance in breathing during sleep), which increases the risk of cardiovascular complications and brain stroke. 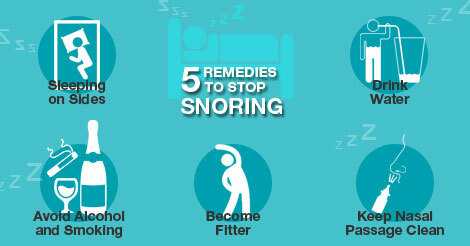 Snoring is also considered as a major problem which affects the marital bliss of many couples. Although, in many cases of snoring, medical interventions are required; here are five tips to reduce the snoring problem. Lying down in a flat position makes the tongue and soft palate relax on the back part of the throat. This minor blockage of airways disrupts the normal inhalation pattern and causes vibratory sounds known as snoring. Sleeping on the sides is thus the easiest way to prevent airway blockage and thus snoring. Weight gain increases the accumulation of fatty tissues around the neck which squeezes the airway and disrupts the free flow of air inside it. Many thin people also snore but if the snoring problem has started after weight gain, weight loss may help. Observational studies suggest that alcohol consumption or smoking before sleep increases the tendency of muscles in the throat to relax and thus increases the chances of snoring. It is advisable to avoid drinking and smoking, at least, three hours before going to bed. Clogged nasal passage increases the speed of inhaled air and thus cause+ snoring. Steam inhalation before sleep can provide clear nasal passage for a long time. Nasal sprays can also be used. If one has a problem of allergy and thus runny nose, antihistamine tablets can help. Staying hydrated can help in avoiding thick nasal and oral secretions which can block the air passage during sleep. A hydrated person is less likely to snore. It needs to be noted that if a person does not experience any changes in snoring pattern or volume after following these tips, he/she may be having advanced disruptive sleep apnea problem and it must be treated as soon as possible.